Planet Earth is a beautiful circular business model. From which we can learn as people and organizations. Linear business models have dominated our global economy in the past centuries. Yet it has devastating effects such as the depletion of finite resources and the creation of waste, which either needs to be stored or ends up in the environment. In the circular economy, we reuse all primary resources and residual materials. Renewable sources provide all energy used. A growing number of companies and other organizations are starting to see the benefits of circular business models and are joining in! 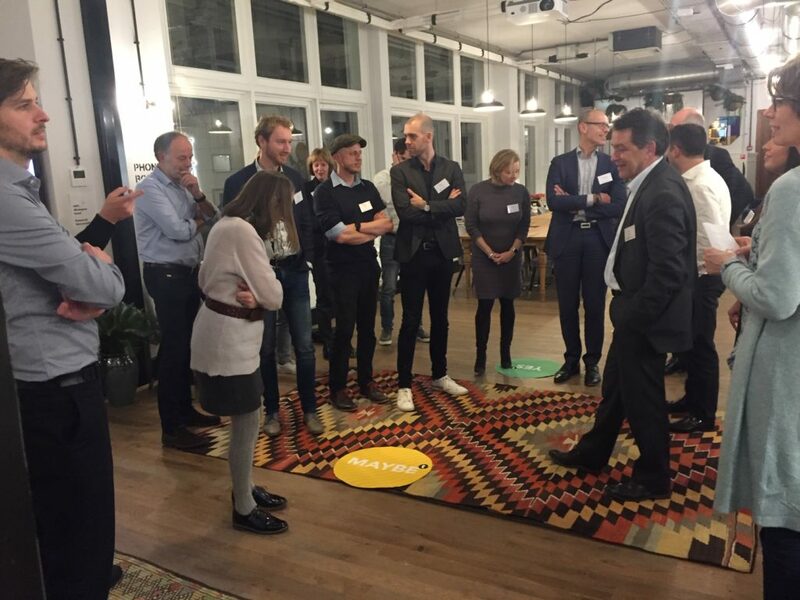 On January 29, 2019, I had the opportunity to facilitate an interactive session with an audience of Nyenrode Business University alumni after listening to Geanne van Arkel, Head of Sustainable Development at Interface (and Dutch CSR Manager of the Year 2018) and Martie van Essen, Program Manager Sustainability Acceleration at the Dutch Ministry of Economic Affairs share their stories about working more circularly. Ray Anderson, founder of carpeting company Interface would ask people this question when they asked him about the business case of working more sustainably. After reading The Ecology of Commerce by Paul Hawken he completely changed the course of his company. He became convinced that, as humanity, we need to learn from nature and we need to stop using fossil fuels. In 1996, Interface launched Mission Zero, the ambitious plan to no longer have a negative impact on the world by 2020.
and 58% of the materials are either recycled or bio-based. The circular approach also yielded added value in other areas: costs came down, the reputation grew, innovation rose, employee and stakeholder engagement grew and the company became more future-proof. 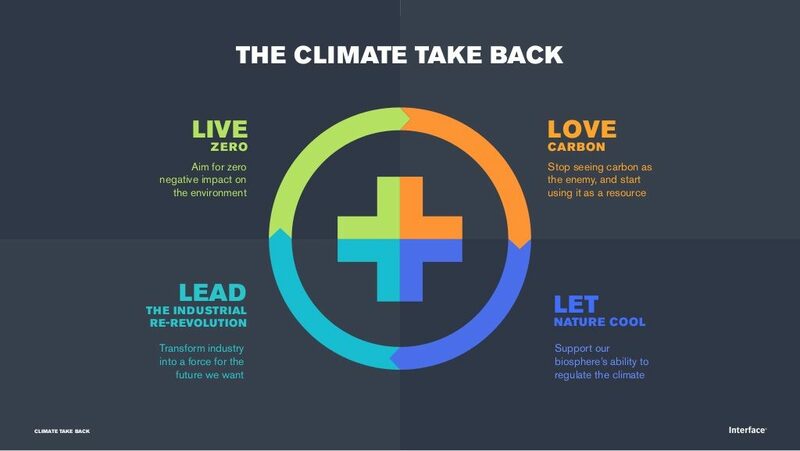 Because 2020 is almost there, Interface launched a new mission: Climate Take Back. It’s objective is to not just eliminate the negative impact but to also contribute positively to the recovery of our planet. Interface doesn’t confine the circular economy to its raw materials; it’s all about new business models, innovation and inspiration as well. An inclusive business model supplies part of the yarns from damaged fishnets from the Philippines and other places. With a great bycatch: H&M and other carpeting companies are also sourcing circular yarns which the supplier created at the request of Interface! Through different programs and regulation, the government stimulates Dutch companies to work in more sustainable and more circular ways. And what does the government actually do itself? With 111 thousand FTE, 10% of all Dutch offices and € 12 billion purchasing power per year, the national government has an enormous impact. And with that the opportunity to drive change. The purchasing power is actually € 72 billion is we add regional governments’ and municipal budgets. And an online marketplace for used office furniture saved € 7.4 million. As much as possible, the government buys refurbished (circular) copiers, reuses its ICT devices, and the army reuses clothing or fiberizes it to recycle it to towels. In the offices, people are encouraged to reuse their paper cups during the day. Cups collected after use are recycled into toilet paper. These measures also deliver cost savings. For example, the army saved € 500 million by reusing clothes. Yet at the same time, circular and sustainable ways of working also raise dilemma’s within the government. Sometimes the scale of what the government needs provides a barrier. For example, there isn’t one supplier which can provide enough circular copiers. And sometimes the switch to new and different business models can require an upfront investment – funded by taxpayers. After these stories, the audience got on its feet to engage with the speakers and each other. They literally had to take a stand in response to various statements about the circular economy. I really enjoyed facilitating the discussions among the audience and with the speakers. Everyone was convinced about the need for more circular business models. And everyone had the ambition to work in a more circular way. Yet there were also plenty of doubts about the willingness and abilities of their organizations to really get going. Everyone expected a large role from the government, through its own actions as well as support and regulation for companies. At the same time, there was a passionate plea from the group not to wait for the government to lead; to just get started. Everyone agreed that this transition requires visionary leaders. Over drinks, we continued to discuss what roles we’d like to take up personally in this exciting field. 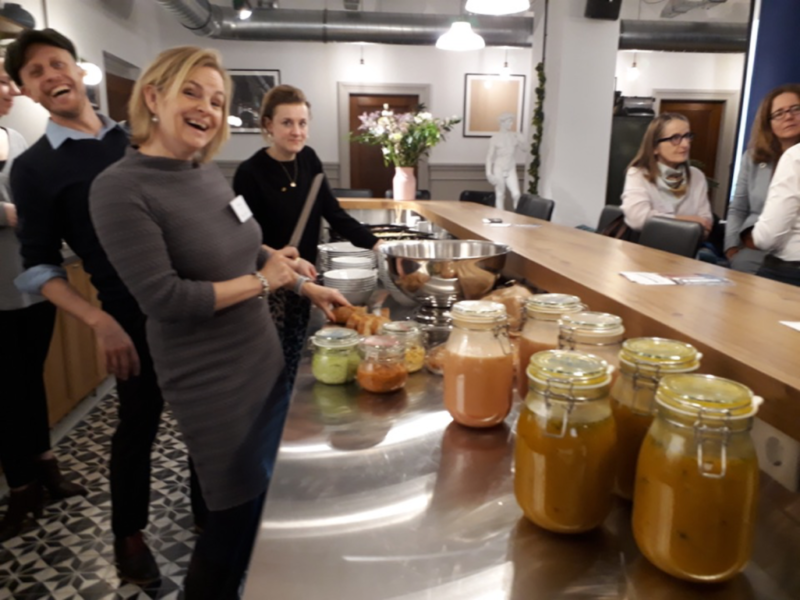 This event was a co-production of the Nyenrode alumni circles for Sustainability and Market & Government following up on an earlier event about the energy transition. An inspiring Mindspace location in central Amsterdam hosted the event. Written by Marjolein Baghuis (@mbaghuis) for the Change in Context blog, the Nyenrode alumni and The Terrace websites To read about interesting people, book reviews and other posts about sustainability, change, and communications please subscribe to this blog in the right-hand column. Never doubt that a small band of caring and committed people can change the world. Indeed it is the only thing that ever has.